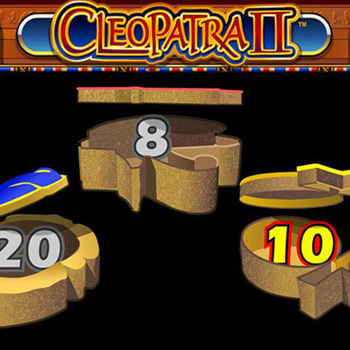 Play with the captivating Cleopatra in this classic five reel slot game, which features a whopping 20 lines for loads of chances to win big! Look out for the lady herself as she offers you encouraging words on your quest for treasure in this unbeatable classic. Cleopatra was one of the very first video slots to appear in Vegas Casinos. It rapidly developed a cult like following and remains hugely popular to this day, when it can be played online across countless websites. There are even different versions of the game, including Cleopatra II,as well as free versions that do not involve real money. This award winning game was created by International Gaming Technology (IGT), who are among the top in their field. As a result, players get to relish in the phenomenal graphics and animations, hi tech functions, plus many thrilling features including various betting options and bonus games. Cleopatra was also one of the first slots to use an Egyptian theme. It captures the true essences and visual elements of the Egyptian period from the days of Cleopatra, using imagery and symbols like hieroglyphics, the Sphinx and Queen Cleopatra herself. Just as these rudiments of ancient Egyptian culture continue to be explored and thought about in modern times, so too does Cleopatra slots remain a firm staple in casinos and gamingarenas across the world. This classic game contains 5 reels plus a total of 20 pay lines. It is possible to bet as many as 5 times per line for a maximum bet of 100 credits, providing players with the opportunity to win up to 10,000 credits! Cleopatra slots are also multi denominational and will fit any budget. You can place bets from around 1p up to £10 per line. 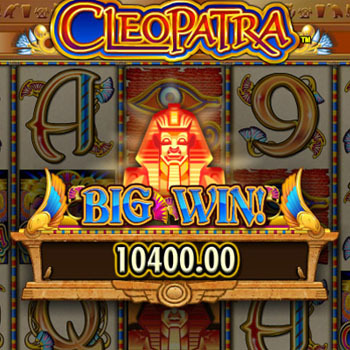 Cleopatra is fundamentally a classic slot which has withstood the test of time. But what makes this game really stand out from the rest is its seductive ancient Egyptian theme. In addition to the stunning graphics, players are treated to sound of Cleopatra’s enchanting voiceover which can keep them enthralled for hours on end. The reel symbols are all based in imagery and characters from Egyptian culture. You can expect to find various hieroglyphics along with a beetle, a Sphinx, the eye of Horus and of course the Queen of the Nile, Cleopatra. The face cards appear in the form of lettering, which serve to remind players that above all else, this is a traditional slot game. Cleopatra Slots offer plenty of bonus action and the Sphinx symbol plays a crucial role here. As well as handing out scatter pay, the Sphinx is also responsible for setting off the Free Spin bonus round. 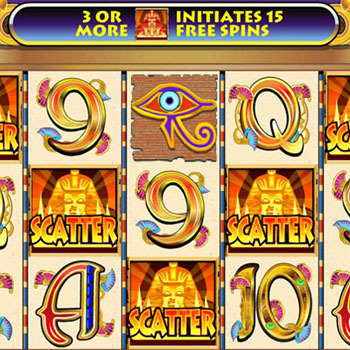 Line up 3 Sphinx symbols in a row and you will open a free spin bonus game, which is Cleopatra’s ‘pièce de rèsistance’. The free spin bonus reveals a special reel which provides 15 free spins, containing additional bonuses and exploding wilds… As the excitement heats up, you can expect to receive even more free spins, as many as 180 if you’re lucky! Whenever you strike a win during the bonus round, you also receive a three times multiplier which can be combined with the x2 Cleopatra wild. In other words, you can watch your original win turn into huge credits. Cleopatra’s other magnificent bonuses revolve around the Wild symbol. Line up 5 Wilds and you will be showered with 50,000 credits, making you feel as though you’ve hit the jackpot! The Cleopatra Wild also doubles any winning combination that it lands on, making this exotic symbol a very lucky one indeed! The bonus rounds in Cleopatra II differ slightly from the original version of the game. Three scatters set off a random amount of spins, anywhere from 7 to 15. 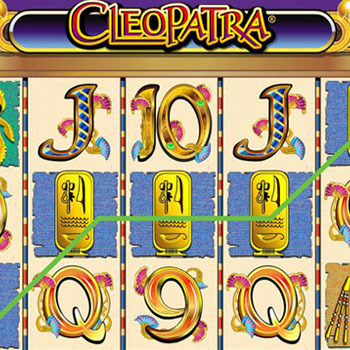 Cleopatra II tends to be more high energy as each individual spin sets off additional multipliers, meaning that your tenth spin can yield 10 extra spins and twenty spins will yield x20 spins, and so on. If you’re a high roller, then Cleopatra II might be the more appropriate game for you! If you like the glitz and glamour of Vegas casino style slots, then you might want to give Cleopatra a try. This game is for those who appreciate it when tradition and technology come together to produce fantastic results. Cleopatra is also suited to players of all budgets and styles of play. You can bet as high or low as you like. There are even free versions of Cleopatra available which are great for practice and risk free enjoyment. But if you are in it for the win, this classic slot can surely prove to be one of the more lucrative and enthralling games on the market.